I felt really bad for the couple below. To become legally married you must ensure the proper filing of your Marriage License and Marriage Certificate in Los Angeles County. Too often I am called from many a couple to correct a problem created by another wedding minister filling out the Marriage Certificate at the bottom of the marriage license and filing the erroneous Marriage Certificate in Los Angeles County. Many wedding ministers are either careless or simply do not know how important it is to the Los Angeles County Clerk’s office that their marriage licenses are completely accurate. One typo, one cross-out, one letter off, one date incorrect, one nickname instead of a birth name, even using ink that is not dark enough can mess things up in a big way. It’s not like a check where you can initial a mistake. The erroneous marriage license cannot be recorded with the L.A. County Clerk so everything must start over and Los Angeles County will charge a $30 fee for a “Duplicate License.” The Duplicate License will be prepared and mailed to the wedding couple who must then contact their officiant to sign the Marriage Certificate and, if the wedding license was issued by an authorized notary such as myself, they must have the authorized notary sign and notarize the new Duplicate License. The resulting Duplicate License will not have the bride’s and groom’s signatures on it. Instead, their signatures will be typed into the signature boxes. Thus, the Duplicate License is much more sterile and less personal than the original marriage license would have been. To top it all off, Duplicate Licenses are not given any priority by the County Clerk so the bride and groom will receive the unsigned and un-notarized Duplicate License at the same time they would have received the official Certified Copies of their Marriage License and Marriage Certificate if the original document did not contain one of the numerous types of errors that will necessitate the preparation of a Duplicate License. Once the Duplicate Marriage License has the required signatures and notary stamp it must be filed again with the County Clerk and the recording process will begin again anew. So the poor wedding couple will not receive their certified copies until several weeks after they normally would. That delay will, in turn, delay the couple’s ability to prove their marriage to many third parties, including any government agencies. This is most important if either of the spouses is in the military, not a United States citizen or plans to change their name after the marriage. So, precision is king when it comes to any Marriage License or Marriage Certificate in Los Angeles County or any California County. The County Recorder is very much into precise information, as it should be. I was reminded of this common problem last week when I received a frantic call from a young couple for whom I had issued a marriage license a month and a half earlier. After their wedding, their priest did not fill out his portion of the marriage license correctly. Weeks after their marriage license and certificate was at the L.A. County Clerk’s office they received the Duplicate License to secure their priest’s signature and my signature and notarization. Since they had some pressing issues that required an immediate resolution they called in a panic and asked me to meet them as soon as possible sign to notarize their Duplicate License. This took much effort on their part to go to all parties and have it corrected and it is far from certain that they will have their Certified Copies in time to address their issue. I wanted to tell them that they could have easily avoided this by doing what many bridal couples do: have me do the marriage license and ceremony privately, and then have the big family wedding via their priest, rabbi, or pastor. It ensures that your wedding day will go off as planned and it will be done correctly. Many couples then have their private anniversaries and their public anniversaries, which is a sweet wedding tradition. 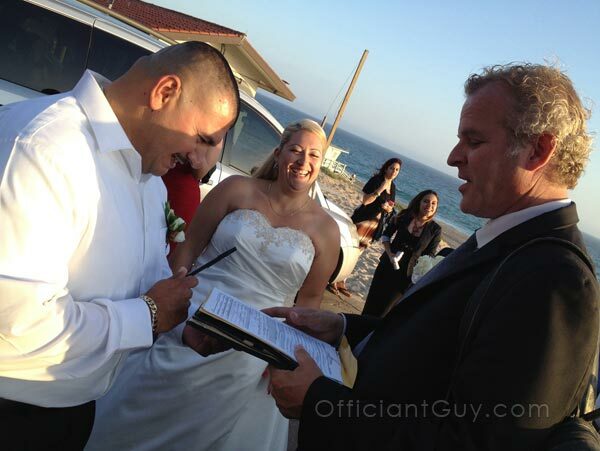 Officiant Guy (on the right) issuing a marriage license on the beach in Malibu. 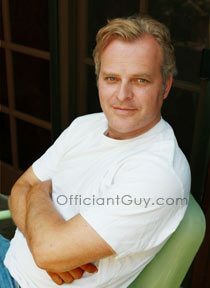 He can issue you a California marriage license anywhere in CA. Being an attorney, I am told often by the people who work at the Registrar Recorder-County Clerk’s Office that I am one of the few wedding ministers who is consistently accurate in my paperwork and one of the only officiants who files my Marriage License and Certificates in person rather than sending them in the mail. I learned in law school and in legal practice that precision on paperwork is a top priority and so it is my second nature. It takes a concentrated focus to get it right consistently. It requires special County certification to issue marriage licenses, but filling out a marriage license accurately is something that is not always done correctly, and the Los Angeles County Clerk’s office are sticklers for accuracy. Many officiants for weddings each year make so many mistakes that they are put on probation or their authority to issue L.A. County marriage licenses is suspended or permanently barred. I am proud to have never received any sort of probation but more fortunate that my clients will not be blaming me for any delays. 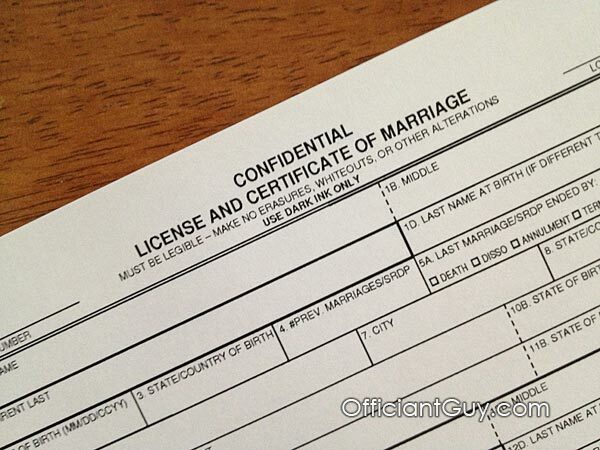 So, if you want your paperwork to be filled out and filed correctly, consider coming to me to issue your marriage license and be your wedding officiant by clicking here. Read my comment on Google+ about marriage licenses.